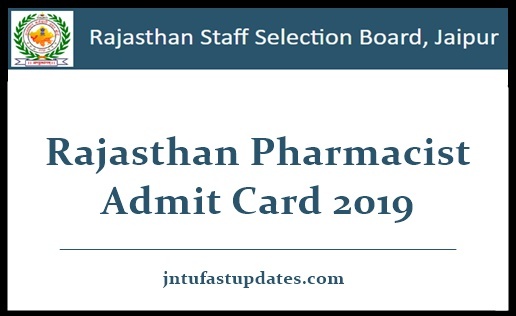 RSMSSB Pharmacist Admit Card 2019: Rajasthan Subordinate and Ministerial Services Selection Board (RSMSSB) is going to conduct the pharmacist written test on 24th February 2019. All the applicants must be aware of the RSMSSB pharmacist exam date 2019. Before going to appear for the written test, candidates who have already applied for the RSMSSB Pharmacist posts must require to download the hall ticket. The hall ticket/admit card is the necessary document to carry to the examination. All the applicants who had enrolled for RSMSSB Pharmacist posts 2019 can download the hall tickets from the official website, rsmssb.rajasthan.gov.in. The hall tickets will be accessible to download before few days of the examination. Hence all the competitors can avail the admit cards when the link is active on RSMSSB website and take a printout to carry to the examination. The examination officers will initially check the admit cards of the aspirants before allowing them to the examination. Hence all the hopefuls competing for Rajasthan Pharmacist written test must carry the admit cards without fail while going to the examination. Rajasthan Subordinate and Ministerial Services Selection Board (RSMSSB) issues various job notifications every year to hire eligible candidates into various government jobs. The board has issued a notification for 1736 pharmacist posts recently. Many of the candidates having suitable eligibility standards have applied for Rajasthan Pharmacist jobs during the application dates. As part of the selection process, the RSMSSB will organize the written test and interview rounds for the applicants. Candidates who have exhibited good merit in the selection rounds will be finally taken into consideration for the employment. Hence the hopefuls applied for Rajasthan Pharmacist posts have to strive hard to clear the selection process as there is a huge competition for Pharmacist posts this year. Candidates can check the downloading process from the following and can follow it to download Rajasthan SSMB admit card without much complication.